We are excited to host two events on February 19th at the Tibetan Gallery & Studio. Join us early for Family Coloring, join us later for Adult Coloring! Coloring For Meditation is now available for pre-order! We are so excited to be able to share the joy of the thanbhochi … go ahead, celebrate your inner artist! Losar Celebration and Fundraiser with the Dalai Lama Foundation: Hold the Date! Time/Location: Beginning August 4th, Sundays, 2-5 p.m. 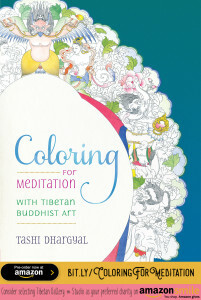 The classes are at the artist’s studio: Tibetan Gallery & Studio, 6770 McKinley Street #130, Sebastopol, CA 95472. For centuries the rich art of Tibet was influenced by its neighbors, India and China. Menlha Dhondup introduced the first original Tibetan painting style in the 1500s. The later styles reflected his work, thus establishing the Menris tradition throughout Tibet.